From left: Barry Andrews, John Andrews, and Pat Quilter. component from only one manufacturer’s catalog. The times changed of course, and it wasn’t long after QSC hung its shingle out that a market structure emerged favoring specialized manufacturing. Following the Tapco 6-channel mixer’s introduction, suddenly the industry entered an era where there were many companies turning tidy profits dedicated solely to the production of loudspeakers, consoles, amplifiers, and other individually specific elements of the systems signal chain. In turn, a new style of audio design took hold in which whole systems based around the integration of choice components supplied from different manufacturers took hold. 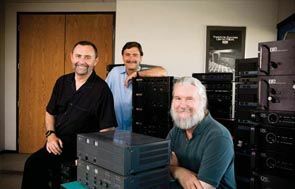 Surviving these lean times and going on to prosper with a business model that produced the Series 3 and Series 1 components in the ‘80s, QSC established its place in the market based on the reputation of its amplifiers. With the emergence of digital control and monitoring in the ‘90s, however, things began to turn full circle, favoring the one-stop systems approach again. QSC entered the digital age by expanding its role to include the manufacture of digital transport and processing technologies, efforts that led to products today including those destined for use within the QSControl.net platform like the BASIS family of processors. Loudspeakers were added to the mix as the calendar took a turn into the 21st century, with QSC’s WideLine Series of compact line array components joining the introduction of new models within the AcousticDesign Series, as well as self-powered enclosures within the HPR line. Continuing to subscribe to just such a philosophy with major investments made on both human and financial levels, QSC finds its place these days in an enviable position of continued growth and expansion, even within a shaky economy.